Registration is now open for spring tennis clinics for both children and adults. The six-week sessions begin May 13. The BSTC offers 3 outdoor hard courts. Courts are open from dawn to dusk. All courts are open for member use except where noted below. Most scheduled activities generally reserve all 3 courts. Tennis lessons are for MEMBERS ONLY. Youth lessons focus on everything from mechanics and fundamentals to conditioning and competitive strategies. Participants are grouped by age and ability. Children can start as early as 4 years old . This year we will be offering the option of weekly, drop-in and full session fees to choose from. Lessons run for 9 weeks beginning June 27. We also offer Saturday lessons once a week. Private lessons are available to members upon request by contacting our tennis pro Lucas Parrau. BSTC's 2018 Tennis Team Members at their first match of the season. Welcome to the Burlington Swim and Tennis Club’s Youth Tennis Team. The Tennis Team’s goal is to introduce our young members to competitive tennis in a fun and informal setting. Our team plays singles and doubles tennis matches against other tennis programs in Burlington and surrounding towns. 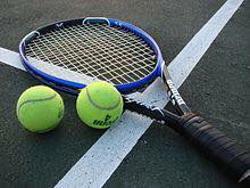 Tennis team is for intermediate and advanced players ages 9-14. The Tennis Team is open to children with a demonstrated ability to consistently serve and maintain a regular volley. Practices are held twice a week in the late afternoon and will begin the week of June 25. The match schedule for the 2018 season, including the specific dates and locations, and of course the end-of-season awards party is to be determined. All schedule changes and cancellations will be posted on our Facebook page. We ask that members pay a registration fee of $16.30 that will cover the cost of the Tennis Team awards party and a trophy. Non-members may join the tennis team at a cost of $126.65 per child. Registration and payment must be received by June 26. This year we are also offering Tennis Team jerseys that are available for sale when you register. The jerseys are $30 each and are encouraged but are not required to participate. This year we are offering the option of weekly and full session fees to choose from. Based on availability, we may have drop-in sessions available as well, so keep an eye out for that. All lessons have a maximum of 8 adults per class. Beginners: Fridays 9-10 a.m. or Saturday 10-11 a.m.
Intermediate: Wednesday 9-10 a.m. or Saturday 9-10 a.m.
Monday through Friday, Ages 4-6: 10-10:30 a.m. or 10:30-11 a.m.
Monday through Friday Camp ages 9 and above: Noon to 1 p.m.
Saturdays, Ages 4-6: 11-11:30 a.m.
Saturdays, Ages 7-8: Noon to 1 p.m. Introducing BSTC Tennis Director Lucas Parreau! We are pleased to announce Lucas Parreau as the newest member of the BSTC team! Please join us in welcoming Lucas to the Burlington Swim and Tennis Club family. Lucas is a tennis professional and coach holding certifications from both the Argentina Tennis Federation and the USPTA since 2004. Previously, Lucas worked as Assistant Director for the Winchester Country Club, Nashawtuc Country Club, and Winchester Swim & Tennis Club for a total of 9 years. Currently, Lucas is a Pro at the Winchester Indoor Lawn and Tennis Club. For the past 9 years, Lucas has specialized in private and group tennis lessons and clinics focusing on improving players’ stroke development and overall game performance. Additionally, Lucas has developed programs that target younger and junior players to help develop their skills at both a recreational and competitive level. Lucas is the head coach of the North Shore, DBH and USTA league teams. Lucas is also the head coach for the Winchester High school boys’ tennis team and has successfully coached them to the MIAA Division II finals in 2013, 2014, 2017 and a state championship in 2016. Originally from Buenos Aires, Argentina, Lucas’ family introduced him to tennis at age 5. Lucas has competed in national and international tournaments since age 12. He was ranked in the top 30 players at age 16 and in the top 20 at age 18. Lucas competed in the national professional tour for 2 years and at age 20, was recruited by University of West Florida. Outside tennis, Lucas is passionate about fitness and soccer.